McLaren Cars is known for making very fast road cars. Emphasis on the “road” part. Easy to drive, quiet when you want them to be, almost supple. This is not that. This is not that at all. This is the McLaren Senna, and it’s here to crush every single track day. This McLaren has windows cut into the doors. 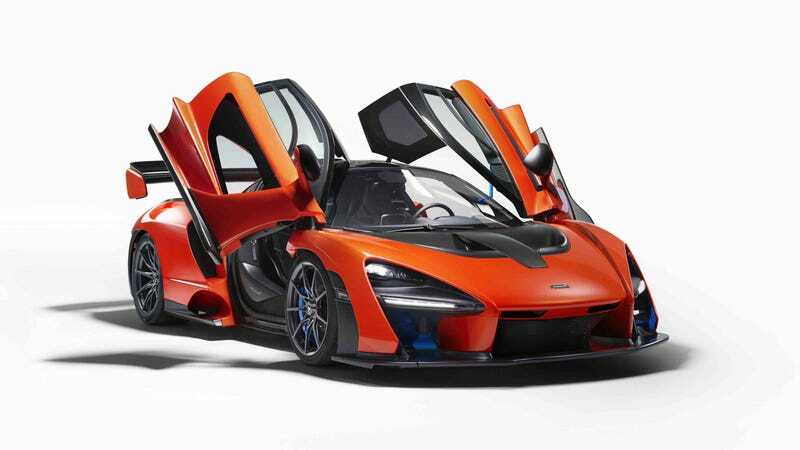 McLaren’s newest Ultimate Series supercar has been officially named the “Senna” as an homage to the legendary championship winning Formula 1 driver of the 80s and 90s, most notably in McLaren chassis. The Senna is based on the same structure that underpins the current 720S model, their “Monocage III” carbon fiber monocoque, and has been fitted with 4.0-liter flat-plane-crank version of their ubiquitous twin-turbocharged V8 producing an impressive 789 horsepower and 590 lb-ft of torque. All of that shifted through a seven-speed dual-clutch gearbox. And unlike the P1, the Senna is not a hybrid—no electric assistance for all that power this time. Production will be limited to just 500 units, and will cost buyers 750,000 pounds sterling. Did you see the windows cut into the doors, though? The “Senna” is a strangely shaped automobile, but often cars that are built with function in mind tend to be slightly ungainly. This car is certainly an expression of function-over-form, with inlets, scoops, flicks, and wings that would seem out of place on your average supercar. McLaren aren’t playing this off as an average supercar, though. The Senna will follow up the ludicrously fast P1 as the brand’s current top level insanity-spec car. McLaren being McLaren, the car has an updated version of the P1's hydraulically-interconnected dampers. Because of this science-fiction hydraulic system, the car has no need for anti-roll bars. They also say they’ve improved the P1's variable stiffness and ride height technology. Above and beyond the 720S system, the Senna features a “Race Mode” with lower ride height and stiffer suspension settings. Paired with this system is a new set of Senna-specific Pirelli P Zero Trofeo R tires, designed with the race track in mind, but are technically still DOT approved. Did I mention the windows cut into the doors? This McLaren is completely next-level when it comes to, well, everything. Weighing in at just 2,641 pounds, this is feather-weight in comparison to pretty much everything else in the class, and considering the nearly 800-horsepower on tap, a proper driver should be able to put down a weapons-grade lap time at any track. If McLaren’s aim was to put an end to the Nurburgring lap time World War II, this car is the Enola Gay to make that happen. If you thought Porsche’s GT2 RS was the newest and fastest thing, the Senna has an additional 89 horsepower and weighs exactly 600 pounds less. Wow. Not only that, but Porsche didn’t cut windows into the doors of the GT2 RS. Delivery begins in Q3 of 2018. So , what are you going to look at through those weird door windows? What Was The Best Formula One Lap of All Time?